For us it really was magical, and a perfect day after experiencing a few rainy one’s. A 45′ minute paddle, about the same again to get to the top and overlook Cirque Lake. A little steep at times, but someone has installed rope lines in places to make the going easier. Look at that reflection…so clear and calm. Our family has been enjoying Whistler summer and winter vacations for nearly 20 years now, and before that, when I was living back in Canada, my father was the first manager of the Blackcomb Lodge so I spent a good amount of time up there skiing in the winter. Those were the early years of Whistler Village and back then it was just hopeful dreams that Whistler would turn out to the be international resort destination, for both summer and winter seasons, that it has become. This past long Labor Day weekend the town was packed, to the point of feeling a little overwhelmed by number of people. We heard languages from around the world as we walked the picturesque village. Afterwards, however, we enjoyed returning to our home on Green Lake, surrounded by pines and evergreens and hardly anyone at home around us. GREEN LAKE DOCKS In the picture above the dock breaks into a “T” at the end. The end portion of the dock can disconnected from the dock creating a raft with furniture, BBQ and an outboard motor to cruise the lake. A number of the homes on Green Lake have this type of docking system. Below one can be seen with the outboard on it. In the summer Whistler is world-class for downhill or mountain biking, hiking, river rafting, golf and swimming in the numerous lakes. Whistler mountain opens up for bikers and hikers and you can take the Peak-to-Peak gondola ride to the neighboring mountain of Blackcomb. In the winter the skiing and boarding is some of the best in the world. Our son Jeff came up from Vancouver to spend some time with us, and our friends John & Tina dropped in on their drive back to Vancouver from Prince Rupert. J&T are very familiar with BC wines and both are great cooks so we enjoyed some wonderful meals paired with great wines. We love Nesters Market for its food variety and their basement Beer & Wine store that has an amazing collection of BC wines. J&T head back to Vancouver for a couple of weeks before heading to Costa Rica where they currently have their boat moored, and then continue on their world tour. We have made plans to join up with them in April in Fort Lauderdale, and cruise the eastern seaboard up to Washington DC. Where Whistler usually means plenty of skiing/boarding for us during winter visits, and biking and hiking in the summers, this trip has been a little more low-key as we wind down our Canada summer visit. 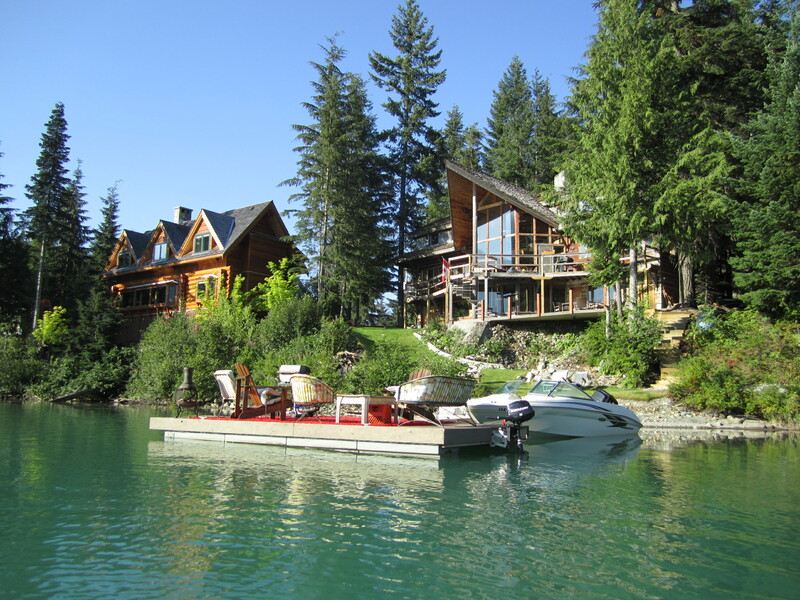 We had three weeks in Vancouver in Yaletown, in a penthouse condo with unobstructed views of False Creek, a week in the Okanagan at my father’s house that overlooks Kalamalka Lake, and now a week on the shores of Green Lake in Whistler. We’ve had some great water views to enjoy on this trip. Below are some photos of the many activities we’ve enjoyed as a family over the years in Whistler. We’ve been seasoned users of Homeexchange.com for many years, exchanging our home in Punta Mita for most of it, and most recently our apartment in Nice. Just like real estate, home exchanging is about location, location, location; the better the location of your property, the better the exchanges you’ll get. Nice has proven so far to be an excellent property for us to exchange. For the summer of 2014 we did a simultaneous exchange for a lovely apartment in Vancouver, Canada, in the chic neighborhood of Yaletown. The building has a stepped roof, so four units are actually penthouse-like units with very large terraces that overlook a park and the inlet of False Creek. We had one of those units and it couldn’t have been a better location. I went to school in Vancouver for some time so I am quite familiar with the city. As well, I have family here and we’ve spent time in town when passing through up to Whistler for summer or winter vacations. We have done numerous exchanges and recently counted seven different buildings we have stayed in around Vancouver, mostly in Yaletown. Looking across False Creek back to downtown Vancouver. Yaletown, or the West End, is wonderful because you can walk or bike easily to all areas of the downtown core. And there is the amazing seawall walk, which wraps around the shoreline of downtown Vancouver. You can drive for miles without crossing any roads or street lights, right in the heart of the city. I don’t think that is possible in any other city. The seawall is a continuous, mostly seaside, path for pedestrians, cyclists, and inline skaters that extends for a total of 22 kilometres. Starting from Coal Harbour, it winds around Stanley Park, along Sunset Beach, around False Creek, past the Burrard Street Bridge, through Vanier Park, and finishes off at Kitsilano BeachPark. The photo below is of one of the most photographed landmarks that can be found along the Stanley Park portion of the seawall. One of the many stylish complexes along the seawall. And when Vancouver is nice, there really is no place like it. The town just comes alive as Vancouverites are very out-going people. From our terrace we watch people boating, sailing, kayaking, biking and running. The park continually has soccer or volleyball games, or people doing calisthenics or yoga. The landscape is continually moving. Vancouver is consistently rated as one of the best most “livable” cities in the world, most recently featured in a study by the magazine The Economist, Vancouver rated 3rd behind Melbourne and Vienna. Toronto was 4th, giving Canada two cities in the top five of 140 cities rated. I brought my inflatable paddle board with me and just had to walk across the street to paddle the inlet. We spent our time by biking the Sea Wall each morning and then doing walks around the city later in the day. Lunches were at home or one of the seaside cafe/bistros. Dinner was with friends at home or at one of the local restaurants. There are amazing restaurants in Vancouver, being a very international city. Wouldn’t know where to being in making recommendations, there are so many. This is a trip that John recently took to the San Juan Islands, which are situated just below Vancouver and Victoria BC and in front of Seattle and Bellingham Washington. The islands are well known for providing a great backdrop for boating, and as well a wonderful showfront for some incredible coastal real estate. We arrived in Point Roberts early on Wednesday, July 2nd, to help with getting the boat ready and gathering provisions for the trip. All crew had arrived by 7PM and we had dinner on board. Point Roberts is just south of Vancouver, a peninsula or point that juts out southward from the Canadian coast, creating a small section of land that for Americans that is only accessible by boat or by first going into Canada from the American mainland and then down into the small town of Point Roberts. It is landlocked. There’s a marina, nice golf course, and numerous homes along the seashore, many of the summer homes for Canadians. Our hosts, Tina and John, welcomed us on board their new 75′ Nordhaven, recently arrived from La Paz, Mexico. They had purchased the boat there and then brought it up in the spring to Point Roberts, close to their home in downtown Vancouver. Also along were John’s parents, Jean and Joe (a long-time and well known fisherman on the BC coast), John’s sister Druanne and her fiancée Ted, and my father Harvey and uncle Gordy. Our planned itinerary was to visit the San Juan Islands, traveling as far south as Olympia before making our way back home. Our first anchorage was in Penn Cove on the lower end of Widbey Island. We passed through Deception Pass when the tide was running and that made for a wild ride. The captain had a little trouble handling the boat as the rushing tide pulled us through, but he got us through it without any incidents, except scaring one small boat owner who had chose to stop in the middle of the very narrow pass. He got out of our way quickly when he saw us coming through. One of the most beautiful drives in North America is between Banff and Jasper, in British Columbia, called the Icefields Parkway. Spectacular mountain range that offers plenty of incredible viewpoints. We were blessed with great weather during the whole trip. We’ve got a photo in here of Clearwater, which isn’t along this route, but we started our trip in the Okanagan, headed north through Kamloops, over to Jasper, down to Banff, and then through the Kootenays, returning to the Okanagan. About a 12-day trip. 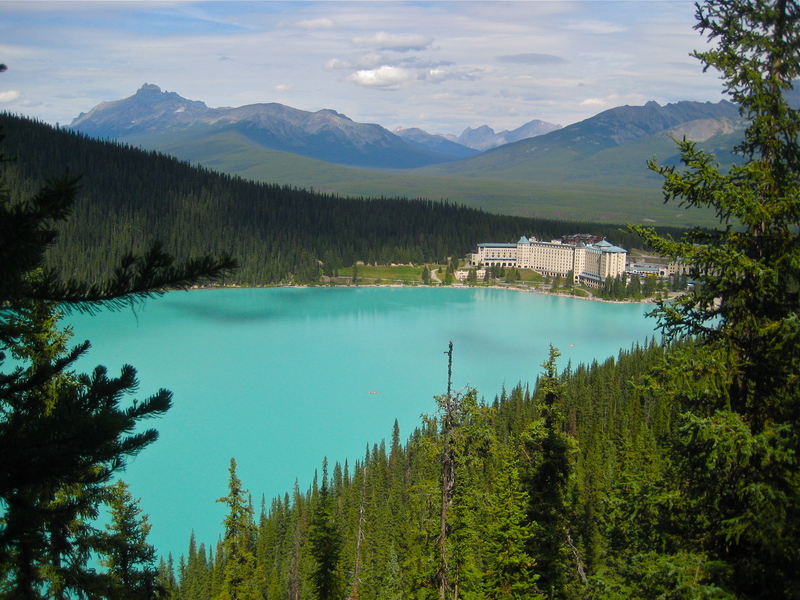 Peyto Lake: Just off the Parkway and a short walk up to a incredible viewpoint of the lake. Moraine Lake and Lodge: Just beautiful. Great, although a workout, trail along the left side of the lake to a high viewpoint (photo below of the lodge was taken from there. Great for canoeing and lots of trails. Maligne Canyon Trail: Very nice walk along the canyon, incredible viewpoints. Athabasca Falls: Along the Parkway. Johnston Canyon Trail: Beautiful, great walk/hike, but as most places, get there early to beat the crowds. Near Clearwater, a number of waterfalls along the Clearwater Valley Rd. 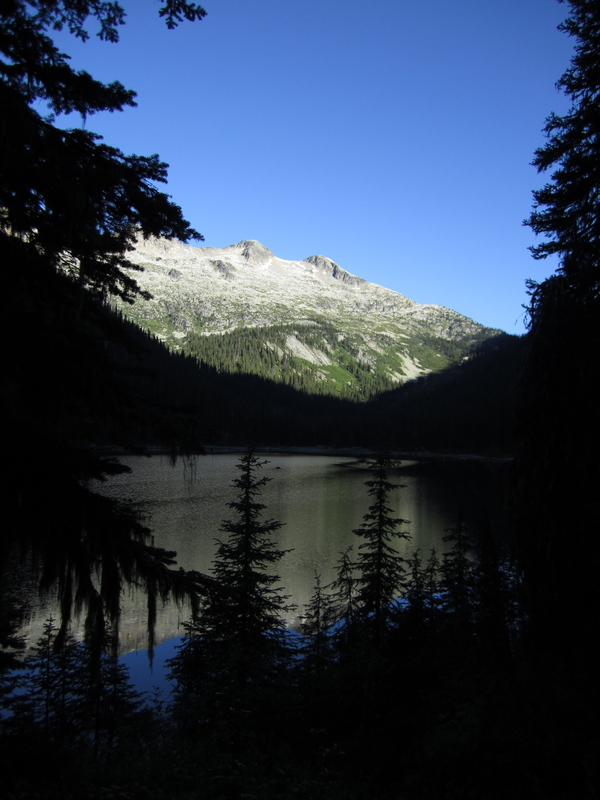 This intermediate hike takes you right up to the Kokanee Glacier. For the first part of it, you can do it with regular shoes, but as you get up to the glacier, you’ll want to have good hiking shoes as the rock is very loose. But that’s quite a ways up the trail and most people only go as far as the provincial cabin, a couple of hours up the trail. The Kokanee Glacier is near at the picturesque town of Nelson, just off of an arm of Kootenay Lake. When heading east of Nelson (you go over the bridge), you’ll see a sign for the Kootenay Glacier on your left. You drive up about a 1/2 hour to Six Miles Lakes, where there is parking available. You’ll see that a number of cars have protection around their tires. These are the people who are camping overnight, as it seems the porcupines like to come out at night and chew on the tires! If you are just there for a day hike, you won’t need to do this. To get up to the Glacier its about a six-hour, there and back hike. A long, but beautiful trip.